Skal du skaffe deg nytt utstyr, er det vanskelig å velge bort Ping når du velger. 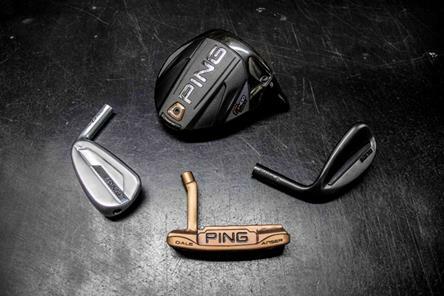 PHOENIX (January 15, 2018): Setting new standards in combined MOI and forgiveness for a driver, PING today introduced the new G400 Max driver, along with the G700 irons, Glide 2.0 Stealth wedges and PING Vault 2.0 putters. The new products are available for pre-order beginning today. Golfers can choose from three premium finishes (Stealth, Platinum or Copper) in five models precision-milled from 303 stainless steel, including the new Dale Anser, which is inspired by one of the original Anser putter moulds created by Allan Dale Solheim and detailed by his father, Karsten Solheim. The award-winning Ketsch mallet (Stealth or Slate finish) combines a fully-machined 6061 aerospace-grade aluminium body with a stainless steel sole plate for an extremely high MOI and offers exceptional alignment features. All the models are fit for stroke and designed with varying alignment aids to fit a golfer’s preferred look and alignment style. As part of the custom-building process that ensures optimal balance, putters between 34" and 36" in length are built with steel sole weights; models 34" and shorter feature tungsten weighting; putters built 36" and longer use aluminium weights.